Chris Stone kept his cool on a turning wicket as Havant secured a six-wicket home win over Bashley in the Southern League premier division on Saturday. Chasing a target of 106 at Havant Park, Stone finished unbeaten on 54 after Brad Taylor, Ben Walker and Stuart Ransley had all been dismissed with just 30 runs on the board. The foundations for the victory had been set earlier with left-arm spinner Chris Morgan taking four for 24. ‘It was a good day at the office for us,’ said Havant captain Ben Walker. ‘Chris batted superbly on a wicket that was taking spin. ‘He is in good form at the moment and hitting the ball as sweetly as ever. ‘He is a quality player and we are lucky to have him in our team. ‘When Bashley batted Chris Morgan and Brad Taylor bowled exceptionally well. ‘We have started the second half of the season with two good wins. Elsewhere in the top flight, Marcus Campopiano (71 not out) and Brighton Mugochi (68) guided Burridge to a five-wicket success over New Milton. Mugochi had earlier taken three for 35 with the ball as the New Forest side were restricted to 197 for eight. It looked bleak for Burridge when they slumped to 64 for four in their reply. But they were rescued by Campopiano and Mugochi, who put on 119 runs for the fifth wicket. Portsmouth’s frail batting was exposed again in their 25-run division one defeat at Bournemouth. Ethan Randall (four for 32) helped restrict the home side to 183 for eight but apart from Fraser Hay (42), the Portsmouth batting line-up failed to click. 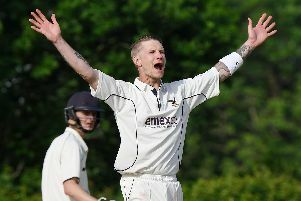 Waterlooville completed a division three double over derby rivals Purbrook with a 56-run win at Rowlands Avenue. The hosts made a steady start through James Scutt (22) and James Hortle (44) before Tim Jackson (47) carried on the good work. Jon Hudson also weighed in with a valuable unbeaten 32 as the hosts finished on 218 for eight. The regular fall of wickets meant Purbrook could never get a foothold in the game – despite the best efforts of Sean Figgins (54). Good performances from Jacob Harris (four for 34), Tom Larner (50) and Greg Kitchen (73) could not prevent Gosport Borough losing by 29 runs at Basingstoke & North Hants II.